Christmas is just a short two weeks away. There are so many holiday parties and get togethers going on. We thought this would make a great holiday gift for your hostess or could even be great just as a dessert for your party. Or shoot, who am I kidding, I make them for myself sometimes at home just to have in the mornings with my coffee. And I will say, these go great with coffee and will soon become one of your favorite Christmas cookie recipes. There is nothing hard about these meringues. I piped them with a Wilton star tip to get this shape. Anything close to this will work. Use whatever you have. When I was developing the recipe, I didn’t even bother with the visual and just spooned the meringue out onto the pan. If that’s all you can do, they still turn out beautiful. They are just a bit more rustic. My tip would be to keep them small. Meringues are crumbly, so the larger they are the messier it is to eat them. Now for the chocolate, use the best you have laying around. Chips won’t work because you will need to use a grater and grate the chocolate into little shavings. For the peppermint, I used a half of a candy cane. I put it in a Ziploc bag and smashed it with a rolling pin to powder basically and measured out a tablespoon for the recipe. You want this to be almost powder, otherwise the chunks are too heavy for the meringue and sink to the bottom. You just want the taste but not the texture. For the baking, I baked these in an extremely low temperature oven. We cooked at 250 F for 50 minutes. Wait for the oven to reach the proper temperature before putting them in. Once the 50 minutes were up, I left them in the oven for about 10 more minutes with the oven turned off. After 10 minutes, I took them out, let them cool completely, and stored them in an airtight container. They should last for about 2 weeks. 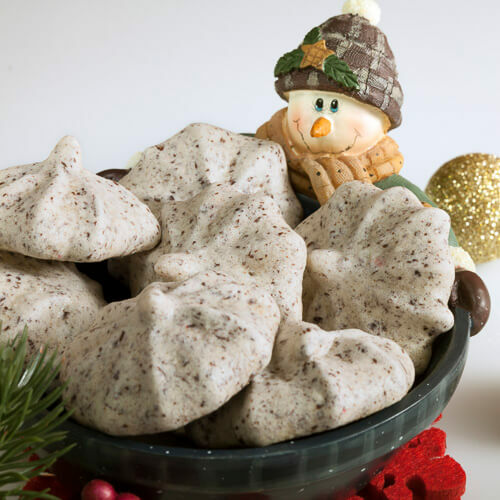 If chocolate isn’t your thing and you just want peppermint meringues, I can help you there. We did a 12 days of Christmas marathon a couple of years back, and this peppermint meringue recipe was included. All our Christmas themed recipes can be found under that category if you are in a hurry. Give the recipe a try. I hope you enjoy it as much as I do. Happy Holidays! Using a box grater, slice/shred the chocolate. Don't let the chocolate melt on your hand. Stop for a minute if you need to. In a bowl of your stand mixer fitted with the whisk attachment, beat the egg whites on low until frothy, then increase the speed to medium high and mix until stiff peaks form when you lift out the whisk, 5-7 minutes. Turn the speed to low and slowly add the sugar, 1 tablespoon at a time. You will know this is done when the meringue holds on to the whisk and keeps the shape when you take it off. Gently fold in the chocolate and peppermint using a spatula. Do not overmix. Pipe the meringues, or drop by spoonful, onto a parchment lined baking sheet. Bake for 50 minutes or until you can lift the meringues off the parchment without them sticking. I can’t believe Christmas is so soon, where has this year gone?! These meringues look delicious; peppermint and chocolate is one of my favourite festive combinations! I know I was just saying that yesterday! The years are zooming by! I’ve been wanting to make holiday meringues forever! You just gave me that final push today! Oh my! These looks so good! I want to munch on them right now! These cookies sound so easy to make and I’m loving the peppermint & chocolate combo. They’d be a great addition to the Holiday cookie tray! Definitely! I also love them as gifts. They travel well. I’d love to pop these little morsels into my mouth! I’m sure they’re super addicting. So addicting. I’m almost sad they are bite size because I can’t stop eating them. Oh, do these look so delicious! These are definitely a must make! Those came out so well, the shape is perfect and I am sure they taste just as good. It is so interesting that it cooks at 250 and a long time, so i will try this. Oooh I love meringues and these are perfect for the holidays. I think I might whip some of these up tonight. Oh my these look so delicious! This will make for a great addition to my cookie making! Og my yes, please. This peppermint dessert looks delish. I would eat the whole plate. Talk about a lovely sweet treat for the Holidays! Meringues are really lovely and it’s nice to play with the flavors too! This chocolate with the peppermint is perfect! These meringues are so festive and unique… totally loving it! I love meringue cookies so I’ll definitely need to try these out! I love eating meringues, but I’ve never made them. I think that needs to change because these sound amazing! 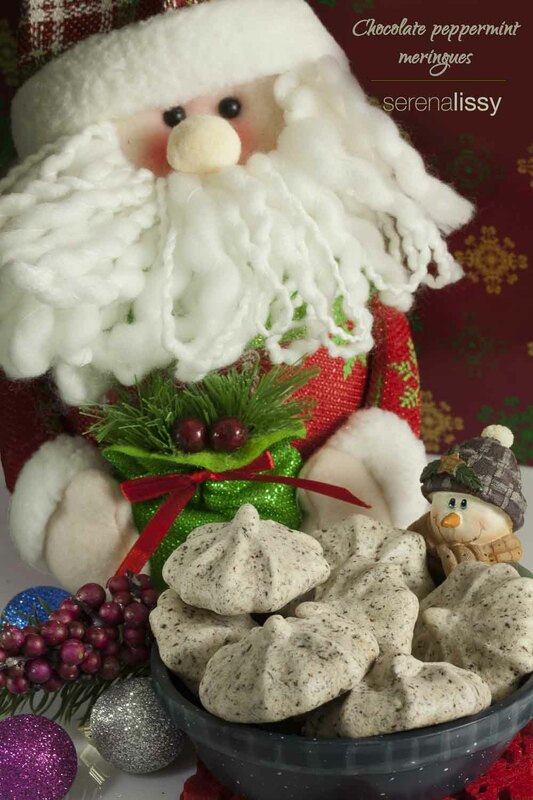 Meringues are a huge part of our Christmas traditions. My mom is a rock star at making them. These look super adorable and very delicious! I’ve been looking for a fun recipe to make for my cookie plates for the neighbors and this looks perfect! These cookies look super delicious! I am so bookmarking this recipe for when I start baking next week! These look amazing! I am a huge peppermint fan, like anything with peppermint in it makes me happy! I may have to try these out here before Christmas! I love all the recipes I’m seeing around using peppermint candy. They seem so fun. Those cookies are so cute, and I imagine very tasty too. I can’t believe there are only four ingredients in this recipe. I am curious as to how these taste…I love chocolate and peppermint together. Oh wow! These look amazing! We have yet to do our holiday baking and these must go on the list! I love meringues but I have never made chocolate ones and peppermint is one of my favorites. Mixing the two is fantastic and I definitely need to try these! I’m not much of a baker, but I would give this recipe a try. It’s so festive and looks delicious! I have never made meringues but they seem like a challenge I would totally take on. Thanks for the recipe. First of all, that Santa is adorable. I don’t even think I’ve ever made meringue cookies before. I have made meringue though. These are cute! I can’t get over that only ingredients/ items are required to bring these meringues to life. They look complicated but once you look at the recipe it is easy peasy. This is on the to try list now! This looks like such a great holiday recipe! I think my kids will love helping me make this treat!! Meringues are intimidating when you haven’t made them yet, but once you try your first recipe, you’ll definitely be surprised at how easy it is to make! I think this one’s really lovely, I like the chocolate-peppermint flavors together! I had no idea that making meringues was so easy! I would love to give these a try, they sound delicious! These look so tasty and I definitely want to make them for a special neighbor treat plate! I really had no idea I could make these so easily and an’t wait to try! your peppermint meringues look so good! I have never heard of these before! I’ve never had a meringue before but they sound like a form of shortbread. I’m a fan of anything with chocolate and these seem easy enough to make for guests or a gift. Yum! They are super simple and are great for gifts or guests. I try to be so good during the holidays but every time I see another peppermint and chocolate recipe my will caves. I just love the flavor combo so much I can’t get enough of every single delicious recipe. I love meringues and my mom always makes a bunch during the holidays among other goodies from Colombia and I would def like to see these on the table, gonna pass the recipe along to her for her to make. THANK YOU.! Chocolate peppermint is perfect for the holiday season maybe I’ll mix it up with some green and red to make it more festive. Definitely! I didn’t see any green at the local store, but would be super cute!